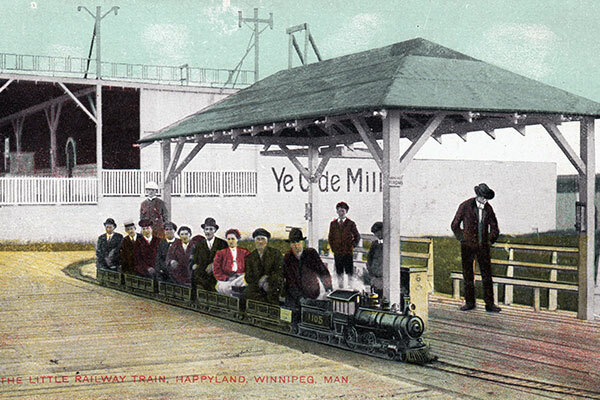 In 1906, a large parcel extending from Portage Avenue to the Assiniboine between Aubrey and Dominion became known as Happyland Park, on land previously used as a golf course. It was privately owned and operated by the American Park Company. It contained many entertainment attractions as well as sports facilities, including picnic grounds, a figure-eight roller coaster, an 80 foot high circular swing, a vaudeville auditorium, restaurant, shooting gallery, open-air ice cream parlour, crazy house, ballroom, an Old Mill with boats for lovers, a miniature steam railway with a station and tiny coaches seating four travelling on a track 12 inches wide, Japanese tea gardens, a baseball park for the former Winnipeg Maroons Club and a bandstand. The entrance to the park was Doric in architectural style extending 600 feet along Portage Avenue. Opening day attendance figures were as high as 44,000 on 24-25 May 1906. 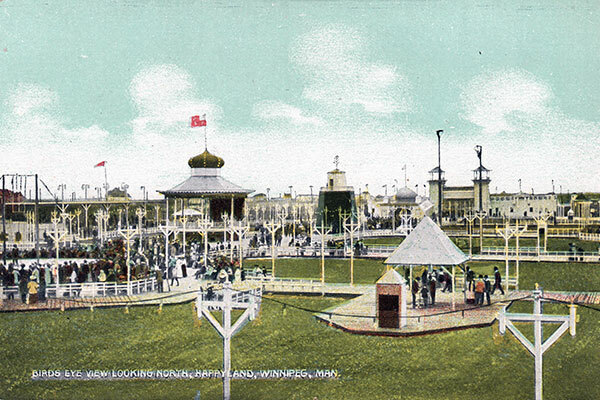 Due to financial troubles, the park was forced to close in 1914. The streets between Aubrey and Dominion were not fully developed until after the First World War. The block of smaller houses on Sherburn Street between Palmerston and Wolseley have remained virtually unchanged and give a fine picture of the development of the street.